The Memorial Day ceremony at the Flanders Field American Cemetery in Waregem is steeped in history. 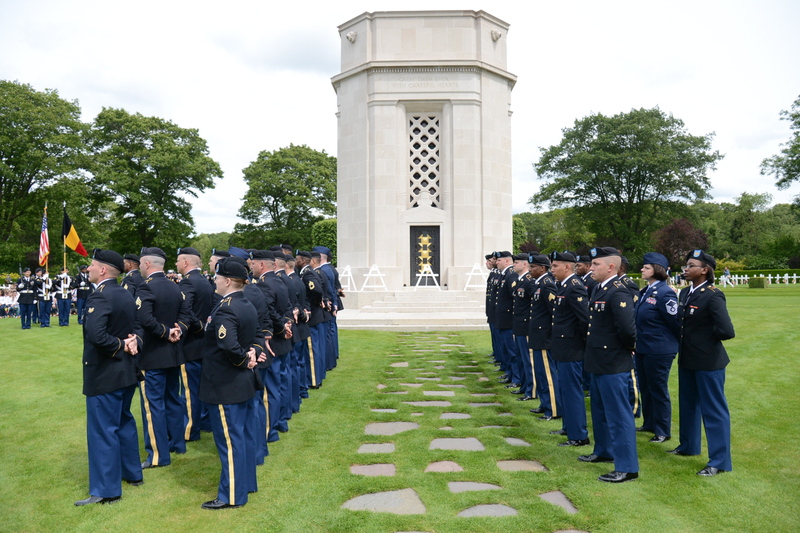 On 3 June 1923, the then brand-new American Overseas Memorial Day Association organized the first Memorial Day ceremony at the cemetery, making it the oldest ceremony in Belgium. General John "Blackjack" Pershing was in attendance, and he attended almost all of the ceremonies at Flanders Field throughout the 1920s. During the ceremony on 30 May 1927, Charles Lindberg flew over the cemetery and dropped poppies from his aircraft in a salute to his countrymen. The ceremony also has a long tradition of a high degree of youth participation. In a tradition that began with that first ceremony in 1923, local Flemish school children, who do not speak English, each year learn the American and Belgian national anthems at school and sing it at the ceremonies. In another tradition that started in the 1980s, a high school student from one of the international schools in Belgium reads John McCrae's famous poem, In Flanders Fields. When compared with the ceremonies at the other two American cemeteries in Belgium, the cemetery itself is smaller, but the local attendance at the ceremony is just as large. The local community strongly supports AOMDA and the annual Memorial Day ceremony. In fact, the community of Waregem has served as the pioneer for most of AOMDA’s youth outreach activities.